The Discworld, as everyone knows, is a flat world balanced on the backs of four elephants which, in turn, stand on the shell of the giant star turtle, the Great A'Tuin, as it slowly swims through space. It is also a global publishing phenomenon with sales of over 70 million books worldwide (but who's counting?). The publication of Snuff brought the Discworld canon to 39 books - not including the various guides, mapps, diaries and other side-projects. That's a lot of Discworld to keep track of - more than most people can manage with just the one head - but fear not: help is at hand! 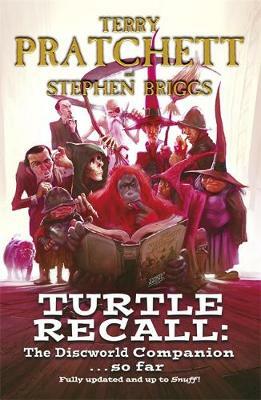 ...look no further than Turtle Recall - the latest Discworld Companion, fully updated and completely up to Snuff! Dearly-loved British Fantasy author, knight of the realm and creator of the fantastic Discworld series. Known as 'Sir Terry' to his legions of fans, he sadly died in March, 2015.